Learn how to recognize when dogs are being threatening or aggressive, or showing signs of stress or fear, and how you should react to lower dogs’ arousal and avoid being bitten. DVD training program for evaluating canine behavior and understanding canine body language. Shows and interprets canine body postures and then shows how to use these body postures to evaluate overall behavioral health. Initially designed for pet professionals, dedicated dog owners will find this program fascinating and informative. Of particular interest to serious behaviorists, trainers, and shelter personnel, where it can be used as a training program for the entire staff. 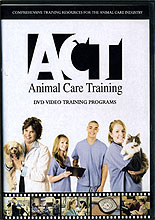 This DVD is recommended by the Certification Council of the Association of Pet Dog Trainers for those preparing for certification. Dr. Suzanne Hetts has helped thousands of pet owners improve their pets’ behavior and relationships. She is often called upon to consult with animal professionals, veterinarians, dog trainers, humane societies and personal injury attorneys to help them understand and work with animal issues.